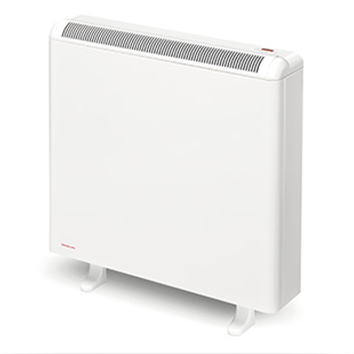 ECOMBI is a new efficient heating system that both controls electricity consumption and optimises heat management. Our system is the most economical of the electric storage heating solutions available in the market. The ECOMBI smart system assesses energy consumption and heat loss in the room every day in order to establish the heat needs precisely and effectively adjusting the energy required. The arrival of ECOMBI is a real revolution in traditional heating systems. ECOMBI optimises control of the energy running costs, while providing maximum comfort. This electric heating system adapts to your daily needs whatever the weather conditions. Could you ask for more? Well you can with the ECOMBI smart system. Once autumn arrives, the temperatures and weather can be very unpredictable well into spring. The days can be cold, very cold or there may even be days when the temperatures are mild and pleasant. ECOMBI constantly monitors room temperature using its high-sensitivity thermostat to ensure that the room is always at the desired temperature. ECOMBI will guarantee you feel warm and comfortable all day long on the coldest days or it will adjust the amount of heat required on those warmer days by means of the ESICC (ECOMBI Smart Input Charge Control) module to adjust the amount of heat required on those warmer days. This will avoid any unnecessary extra energy consumption.. 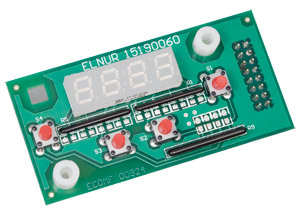 The best quality components available on the market and this exclusive ESICC electronic module, patented and designed by ELNUR, provide an outstanding level of performance and offer the user cheaper and customised heating. This is what the ECOMBI System, the most innovative and outstanding heating system and the only one of its kind on the market, is all about. The cornerstone of ECOMBI technological innovation patented by ELNUR is the dynamic management of the energy charging. The use of the high sensitivity thermostats in electric heating units is essential to ensure greater control of their electricity consumption and to manage the temperature. ECOMBI incorporates this control system within its ESICC electronic management module. 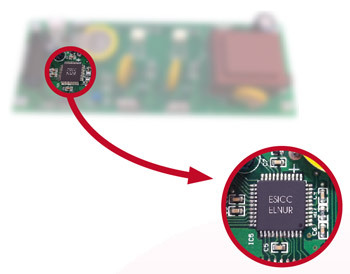 The ESICC module includes a high sensitivity and precision thermostat with an accuracy of ± 0,1 ºC, which continuously measures the temperature of the room and keeps the warmth at the comfort level desired by the customer. Taking into account the temperature readings of the thermostat and the real heat needs in the room, the ESICC electronic management module assesses the energy consumption of the unit during the day and automatically adjusts energy charging to your comfort needs. The automatic charge adjustment determines the amount of energy that the system forecasts that you will need and dynamically adjusts it each day, which will effectively reduce energy consumption. ESICC (ECOMBI Smart Input Charge Control) electronic management module.